For other uses, see Pangaea (disambiguation). 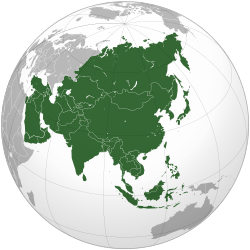 Pangaea or Pangea (pronunciation: /pænˈdʒiːə/) was a supercontinent that existed during the late Paleozoic and early Mesozoic eras. It assembled from earlier continental units approximately 300 million years ago, and it began to break apart about 175 million years ago. In contrast to the present Earth and its distribution of continental mass, much of Pangaea was in the southern hemisphere and surrounded by a superocean, Panthalassa. Pangaea was the last supercontinent to have existed and the first to be reconstructed by geologists. The name "Pangaea/Pangea" is derived from Ancient Greek pan (πᾶν, "all, entire, whole") and Gaia (Γαῖα, "Mother Earth, land"). The concept that the continents once formed a continuous land mass was first proposed by Alfred Wegener, the originator of the theory of continental drift, in his 1912 publication The Origin of Continents (Die Entstehung der Kontinente). He expanded upon his hypothesis in his 1915 book The Origin of Continents and Oceans (Die Entstehung der Kontinente und Ozeane), in which he postulated that, before breaking up and drifting to their present locations, all the continents had formed a single supercontinent that he called the "Urkontinent". The name "Pangea" occurs in the 1920 edition of Die Entstehung der Kontinente und Ozeane, but only once, when Wegener refers to the ancient supercontinent as "the Pangaea of the Carboniferous". Wegener used the Germanized form "Pangäa", but the name entered German and English scientific literature (in 1922 and 1926, respectively) in the Latinized form "Pangaea" (of the Greek "Pangaia"), especially due to a symposium of the American Association of Petroleum Geologists in November 1926. The forming of supercontinents and their breaking up appears to have been cyclical through Earth's history. There may have been many others before Pangaea. 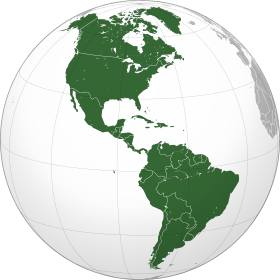 The fourth-last supercontinent, called Columbia or Nuna, appears to have assembled in the period 2.0–1.8 Ga. Columbia/Nuna broke up and the next supercontinent, Rodinia, formed from the accretion and assembly of its fragments. Rodinia lasted from about 1.1 billion years ago (Ga) until about 750 million years ago, but its exact configuration and geodynamic history are not nearly as well understood as those of the later supercontinents, Pannotia and Pangaea. 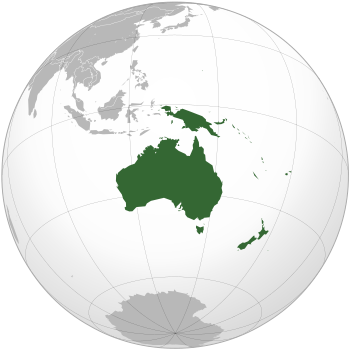 In the Cambrian period, the continent of Laurentia, which would later become North America, sat on the equator, with three bordering oceans: the Panthalassic Ocean to the north and west, the Iapetus Ocean to the south and the Khanty Ocean to the east. In the Earliest Ordovician, around 480 Ma, the microcontinent of Avalonia – a landmass incorporating fragments of what would become eastern Newfoundland, the southern British Isles, and parts of Belgium, northern France, Nova Scotia, New England, Iberia and northwest Africa – broke free from Gondwana and began its journey to Laurentia. Baltica, Laurentia, and Avalonia all came together by the end of the Ordovician to form a minor supercontinent called Euramerica or Laurussia, closing the Iapetus Ocean. The collision also resulted in the formation of the northern Appalachians. Siberia sat near Euramerica, with the Khanty Ocean between the two continents. While all this was happening, Gondwana drifted slowly towards the South Pole. This was the first step of the formation of Pangaea. The second step in the formation of Pangaea was the collision of Gondwana with Euramerica. By Silurian time, 440 Ma, Baltica had already collided with Laurentia, forming Euramerica. Avalonia had not yet collided with Laurentia, but as Avalonia inched towards Laurentia, the seaway between them, a remnant of the Iapetus Ocean, was slowly shrinking. Meanwhile, southern Europe broke off from Gondwana and began to move towards Euramerica across the newly formed Rheic Ocean. It collided with southern Baltica in the Devonian, though this microcontinent was an underwater plate. The Iapetus Ocean's sister ocean, the Khanty Ocean, shrank as an island arc from Siberia collided with eastern Baltica (now part of Euramerica). Behind this island arc was a new ocean, the Ural Ocean. Western Kazakhstania collided with Baltica in the Late Carboniferous, closing the Ural Ocean between them and the western Proto-Tethys in them (Uralian orogeny), causing the formation of not only the Ural Mountains but also the supercontinent of Laurasia. This was the last step of the formation of Pangaea. 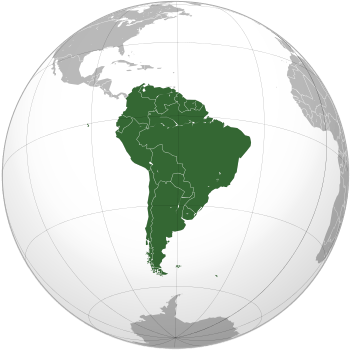 Meanwhile, South America had collided with southern Laurentia, closing the Rheic Ocean and forming the southernmost part of the Appalachians and Ouachita Mountains. 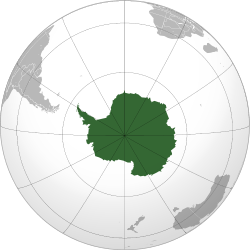 By this time, Gondwana was positioned near the South Pole and glaciers were forming in Antarctica, India, Australia, southern Africa and South America. The North China block collided with Siberia by Late Carboniferous time, completely closing the Proto-Tethys Ocean. By Early Permian time, the Cimmerian plate split from Gondwana and headed towards Laurasia, thus closing the Paleo-Tethys Ocean, but forming a new ocean, the Tethys Ocean, in its southern end. Most of the landmasses were all in one. By the Triassic Period, Pangaea rotated a little and the Cimmerian plate was still travelling across the shrinking Paleo-Tethys, until the Middle Jurassic time. The Paleo-Tethys had closed from west to east, creating the Cimmerian Orogeny. Pangaea, which looked like a C, with the new Tethys Ocean inside the C, had rifted by the Middle Jurassic, and its deformation is explained below. Additional evidence for Pangaea is found in the geology of adjacent continents, including matching geological trends between the eastern coast of South America and the western coast of Africa. The polar ice cap of the Carboniferous Period covered the southern end of Pangaea. Glacial deposits, specifically till, of the same age and structure are found on many separate continents which would have been together in the continent of Pangaea. The continuity of mountain chains provides further evidence for Pangaea. 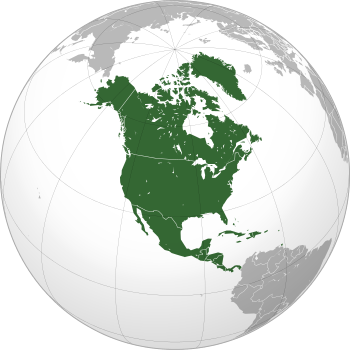 One example of this is the Appalachian Mountains chain which extends from the southeastern United States to the Caledonides of Ireland, Britain, Greenland, and Scandinavia. The Atlantic Ocean did not open uniformly; rifting began in the north-central Atlantic. 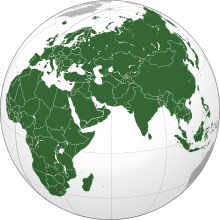 The South Atlantic did not open until the Cretaceous when Laurasia started to rotate clockwise and moved northward with North America to the north, and Eurasia to the south. The clockwise motion of Laurasia led much later to the closing of the Tethys Ocean. Meanwhile, on the other side of Africa and along the adjacent margins of east Africa, Antarctica and Madagascar, new rifts were forming that would lead to the formation of the southwestern Indian Ocean that would open up in the Cretaceous. 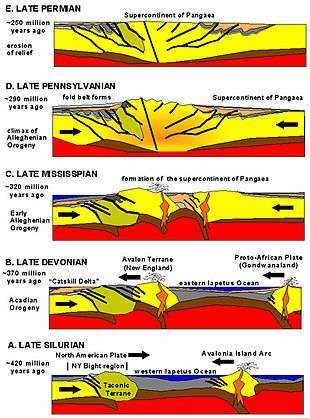 What can also be observed in relation to tectonic plates and Pangaea, is the formations to such plates. Mountains and valleys form due to tectonic collisions as well as earthquakes and chasms. Consequentially, this shaped Pangaea and animal adaptations. Furthermore, plate tectonics can contribute to volcanic activity, which is responsible for extinctions and adaptations which have evidently affected life over time, and without doubt on Pangaea. Over the 100 million years Pangaea existed, many species had fruitful times whereas others struggled. The Traversodontidae is an example of such prospering animals, eating a diet of only plants. Plants dependent on spore reproduction had been taken out of the ecosystems, and replaced by the gymnosperm plant, which reproduces through the use of seeds instead. These plants were also able to transport water internally, allowing animals that ate it to also improve hydration. Later on, insects (beetles, dragonflies, mosquitos) also thrived during the Permian period (250–300) million years ago. However, the Permian extinction would eventually come and greatly impact these insects through a mass extinction, being the only mass extinction to affect insects. When the Triassic Period came, many reptiles were able to also thrive, including Archosaurs, which is an ancestor to modern-day crocodiles and birds. Little is known about marine life back to date during the existence of Pangaea. Scientists are unable to find substantial evidence or fossilized remains in order to assist them in answering such a question. 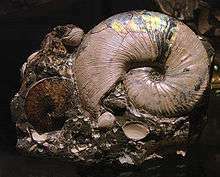 However, a couple of marine animals have been discovered to exist at the time- the Ammonites and Brachiopods. Additionally, evidence pointing towards massive reefs with varied ecosystems, especially in the species of sponges and coral, has also been discovered. Pangaea has tremendously affected the setup of the world now. We live in a post Pangaea time period where the reconfiguration of continents and oceans has changed the climate of many areas. There is scientific evidence that proves that climate was drastically altered. When the continents separated and reformed themselves, it changed the flow of the oceanic currents and winds. The scientific reasoning behind all of the changes is Continental Drift. 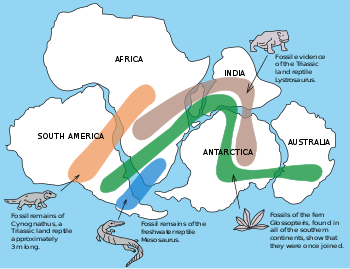 The theory of Continental Drift, created by Alfred Wegener, explained how the continents shifted Earth’s surface and how that affected many aspects such as climate, rock formations found on different continents and plant and animal fossils. Wegener studied plant fossils from the frigid Arctic of Svalbard, Norway. He determined that such plants were not meant to adapt to a glacial climate. The fossils he found were from tropical plants that were meant to adapt and thrive in warmer and tropical climate. Because we would not assume that the plant fossils were capable of traveling to a different place we suspect that Svalbard possibly had a warmer, less frigid climate in the past. When Pangaea separated, the reorganization of the continents changed the function of the oceans and seaways. The restructuring of the continents, changed and altered the distribution of warmth and coolness of the oceans. When North America and South America connected, it stopped equatorial currents from passing from the Atlantic Ocean to the Pacific Ocean. Researchers have found evidence by using computer hydrological models to show that this strengthened the Gulf Stream by diverting more warm currents towards Europe. Warm waters at high latitudes led to an increased evaporation and eventually atmospheric moisture. Increased evaporation and atmospheric moisture resulted in increased precipitation. Evidence of increased precipitation is the development of snow and ice that covers Greenland, which led to an accumulation of the icecap. Greenland’s growing ice cap led to further global cooling. Scientists also found evidence of global cooling through the separation of Australia and Antarctica and the formation of the Antarctic Ocean. Ocean currents in the newly formed Antarctic or Southern Ocean created a circumpolar current. The creation of the new ocean that caused a circumpolar current eventually led to atmospheric currents that rotated from west to east. Atmospheric and oceanic currents stopped the transfer of warm, tropical air and water to the higher latitudes. As a result of the warm air and currents moving northward, Antarctica cooled down so much that it became frigid. Although many of Alfred Wegener’s theories and conclusions were valid, scientists are constantly coming up with new innovative ideas or reasoning behind why certain things happen. Wegener’s theory of Continental Drift was later replaced by the theory of tectonic plates. There is evidence to suggest that the deterioration of northern Pangaea contributed to the Permian Extinction, one of Earth’s five major mass extinction events, which resulted in the loss of over 90% of marine and 70% of terrestrial species. There were three main sources of environmental deterioration which are believed to have had a hand in the extinction event. The first of these sources is a loss of oxygen concentration in the ocean which caused deep water regions called the lysocline to grow shallower. With the lysocline shrinking, there were fewer places for calcite to dissolve in the ocean, considering calcite only dissolves at deep ocean depths. This led to the extinction of carbonate producers such as brachiopods and corals that relied on dissolved calcite to survive. The second source is the eruption of the Siberian Traps, a large volcanic event which is argued to be the result of Pangaean tectonic movement. This had several negative repercussions on the environment, including metal loading and excess atmospheric carbon. Metal loading, the release of toxic metals from volcanic eruptions into the environment, led to acid rain and general stress on the environment. These toxic metals are known to infringe on vascular plants’ ability to photosynthesize, which may have resulted in the loss of Permian-era flora. Excess CO2 in the atmosphere is believed to be the main cause of the shrinking of lysocline areas. The third cause of this extinction event that can be attributed to northern Pangaea is the beginnings of anoxic ocean environments, or oceans with very low oxygen concentrations. The mix of anoxic oceans and ocean acidification due to metal loading led to increasingly acidic oceans, which ultimately led to the extinction of benthic species. ↑ "Pangaea". Online Etymology Dictionary. 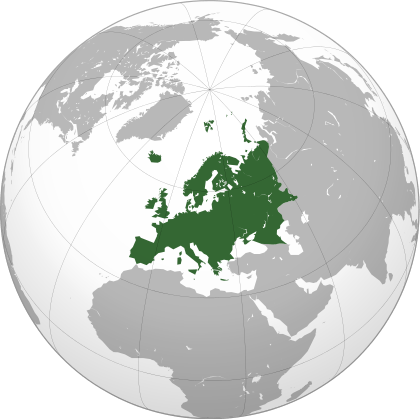 ↑ As "Pangaea", it appears in Greek mythology as a mountain battle site during the Titanomachia. As "Pangaeus", it was the name of a specific mountain range in southern Thrace. "Pangaea" also appears in Vergil's Georgics and Lucan's Pharsalia The scholiast on Lucan glossed Pangaea id est totum terra—"Pangaea: that is, all land"—as having received its name on account of its smooth terrain and unexpected fertility. ↑ Lewis, C.T. & al. "Pangaeus" in A Latin Dictionary. (New York), 1879. ↑ Usener, H. Scholia in Lucani Bellum Civile, Vol. I. (Leipzig), 1869. ↑ Jaworski, Erich (1922). "Die A. Wegenersche Hypothese der Kontinentalverschiebung". Geologische Rundschau. 13: 273–296. doi:10.1007/bf01799790. ↑ Willem A. J. M. van Waterschoot van der Gracht (and 13 other authors): Theory of Continental Drift: a Symposium of the Origin and Movements of Land-masses of both Inter-Continental and Intra-Continental, as proposed by Alfred Wegener. X + 240 S., Tulsa, Oklahoma, USA, The American Association of Petroleum Geologists & London, Thomas Murby & Co.
↑ Zhao, Guochun; Cawood, Peter A.; Wilde, Simon A.; Sun, M. (2002). "Review of global 2.1–1.8 Ga orogens: implications for a pre-Rodinia supercontinent". Earth-Science Reviews. 59: 125–162. Bibcode:2002ESRv...59..125Z. doi:10.1016/S0012-8252(02)00073-9. ↑ Zhao, Guochun; Sun, M.; Wilde, Simon A.; Li, S.Z. (2004). "A Paleo-Mesoproterozoic supercontinent: assembly, growth and breakup". Earth-Science Reviews. 67: 91–123. doi:10.1016/j.earscirev.2004.02.003. ↑ Stanley, Steven (1998). Earth System History. USA. pp. 355–359. ↑ Benton, M.J. (2005) Vertebrate Palaeontology. Third edition, Oxford, p. 25. ↑ Deconto, Robert M.; Pollard, David (2003). "Rapid Cenozoic glaciation of Antarctica induced by declining atmospheric CO2". Nature. 421 (6920): 245–9. doi:10.1038/nature01290. PMID 12529638. ↑ "Pangea | supercontinent". Encyclopedia Britannica. Retrieved 2015-10-29. 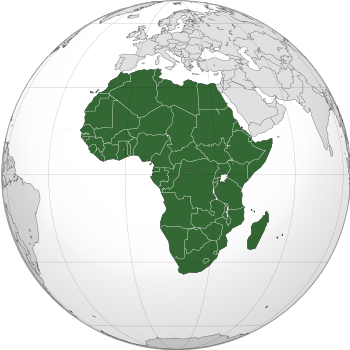 ↑ "Facts About Pangaea, Ancient Supercontinent". LiveScience.com. Retrieved 2015-10-29. ↑ "Pangaea to the Present Lesson #2 | Volcano World | Oregon State University". volcano.oregonstate.edu. Retrieved 2015-10-29. ↑ Ranivoharimanana, Lovasoa; Kammerer, Christian F.; Flynn, John J.; Wyss, André R. (2011). "New material of Dadadon isaloi (Cynodontia, Traversodontidae) from the Triassic of Madagascar". Journal of Vertebrate Paleontology. 31 (6): 1292–1302. doi:10.1080/02724634.2011.618154. ↑ "Permian Period: Climate, Animals & Plants". LiveScience.com. Retrieved 2015-10-29. ↑ "Alfred Wegener". www.ucmp.berkeley.edu. Retrieved 2015-10-29. ↑ Tabor, Neil J.; Poulsen, Christopher J. (2008). "Palaeoclimate across the Late Pennsylvanian–Early Permian tropical palaeolatitudes: A review of climate indicators, their distribution, and relation to palaeophysiographic climate factors". Palaeogeography, Palaeoclimatology, Palaeoecology. 268 (3–4): 293–310. doi:10.1016/j.palaeo.2008.03.052. ↑ "continental drift". National Geographic Education. Retrieved 2015-10-29. 1 2 3 "Sea Level Change". cgge.aag.org. Retrieved 2015-10-29. ↑ "Continental Drift: Theory & Definition". LiveScience.com. Retrieved 2015-10-29. ↑ Ivanov, A. V. (2007). "Evaluation of different models for the origin of the Siberian traps". GSA Special Papers. 430: 669–691. doi:10.1130/2007.2430(31). ISBN 978-0-8137-2430-0. ↑ Beauchamp, Benoit; Grasby, Stephen E. (2012). "Permian lysocline shoaling and ocean acidification along NW Pangea led to carbonate eradication and chert expansion". Palaeogeography, Palaeoclimatology, Palaeoecology. 350–352: 73–90. doi:10.1016/j.palaeo.2012.06.014. ↑ Grasby, Stephen E.; Beauchamp, Benoit; Bond, David P.G. ; Wignall, Paul; Talavera, Cristina; Galloway, Jennifer M.; Piepjohn, Karsten; Reinhardt, Lutz; Blomeier, Dierk (2015). "Progressive environmental deterioration in northwestern Pangea leading to the latest Permian extinction". Geological Society of America Bulletin. 127 (9–10): 1331–1347. doi:10.1130/B31197.1. 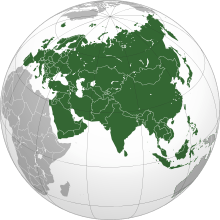 Wikimedia Commons has media related to Pangaea. Look up Pangaea in Wiktionary, the free dictionary.